"We really do need to be conscious of the fact that we're in a global community and working for peace and justice in very real and concrete ways," says the Rev. Myrna Bethke. NEW YORK (UMNS) — Each year, on the anniversary of the Sept. 11 terrorist attacks, the Rev. Myrna Bethke has two roles: pastor and grieving family member. During the family service at the World Trade Center site, she remembers her brother, William Bethke, who perished in the towers that day. Later, in her own community, she helps lead a general memorial service. Her 36-year-old brother worked in the computer processing department at Marsh & McLennan, which lost 295 employees on Sept. 11. His name is etched on the company’s memorial to its lost employees, adjacent to its offices at 1166 Avenue of the Americas. Beneath each name is a facsimile of the employee’s signature. Since his death, her mother, Marie, has started leading workshops “helping people learn the healing power of laughter” as a way “to keep life in perspective.” Her father, Brud, tags along. He was diagnosed with cancer this year. Bethke herself has discovered that the basic foundations of her life have been strengthened and reinforced since the tragedy. "We really do need to be conscious of the fact that we're in a global community and working for peace and justice in very real and concrete ways," she explains. "For me, it was the church that gave the foundation for that and a way to respond to 9/11." 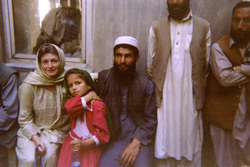 In June 2002, she was part of an interfaith delegation to Afghanistan, sponsored by Global Exchange, an international human rights organization. United Methodist Bishop Joseph Sprague was also a member of the delegation. Bethke joined the delegation in hopes of gaining a better understanding of the circumstances that led to the terrorist attacks and to see how religious groups could make tentative connections with Muslims there. While she found a capital city, Kabul, devastated by war and drought, there did seem to be a fragile hope as the country tried to emerge from Taliban control. But Bethke is discouraged about the recent news she’s heard out of Afghanistan and hates the thought of the places she visited, such as the markets, being bombed. “I suspect it’s a lot less safe than it was when I was there,” she says. While a pastor at First United Methodist Church in Freehold, she led a clergy effort of reconciliation when the New Jersey community became polarized over the issue of undocumented immigrants. The Freehold Clergy Association, which includes Christians, Muslims and Jews, hosted a community forum about the immigrants, many from Mexico, who come to work in landscaping and construction or at race tracks and restaurants. Bethke believes the United Methodist Church needs to be more intentional about involvement in interfaith and ecumenical discussions. The Rev. Myrna Bethke (left), sits with Amira, an Afghan girl who lost most of her family during U.S. bombing near Kabul. The Rev. Myrna Bethke (left), pastor at Red Bank (N. J.) United Methodist Church, sits with Amira, an Afghan girl who lost most of her family during U.S. bombing near Kabul, Afghanistan, at a memorial service for the bombing victims. 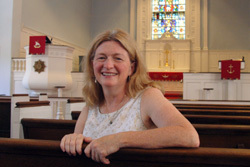 Bethke, who lost her brother William in the Sept. 11, 2001, World Trade Center attacks, was part of a June 16-29, 2002 interfaith delegation to Afghanistan, sponsored by Global Exchange, an international human rights organization. A UMNS photo courtesy of Myrna Bethke. Photo # 061040. Accompanies UMNS story #533, 9/11/06. Since 9/11, she has sought out relationships with Muslims in her community. This year, for example, she took her confirmation class to a mosque during Ramadan. When the group drove up to the mosque, they saw a CROP walk sign, and an instant connection was made. Bethke also is involved with an organization called “Peaceful Tomorrows,” founded by some family members of those who were killed on Sept. 11, and has participated in occasional speaking engagements for the group. Such an emphasis appeals to Bethke, who has a daughter, Christa, entering college this fall, and a 15-year-old son, Daniel.